We know what it’s like to start and run a business. We know what it’s like from the standpoint of a business attorney because we’ve represented them for more than a decade. Also, we’ve done it ourselves. Therefore, whether you’re looking to form your first corporation, finalizing the details of that multi-million dollar acquisition, or anything in between, we can help. Additionally, we also know that high rates and inflexible fee models offered by larger firms are not always necessary. As a result, we’ve endeavored to keep our overhead low and our billing methods agile – to provide you with the advice you need at a price you can afford, all while delivering the highest level of legal representation. Big Firm Knowledge. Small Firm Fees. We know that you have lots of options when selecting your legal representation, and that many small firms tout experience and professionalism despite their size. However few can say what we can – that our firm was formed by a business attorney and full partner at one of the largest and most prestigious business law firms in Michigan. Moreover, he graduated in the top 5 of his class from the world-renowned University of Michigan Law School. Also, he literally helped write the book on Michigan corporations law while working each day to serve on the cutting edge of his client’s organizational, financing, software, and technological legal needs. Even better, while operating Hoeg Law, Richard has continued his relationship as affiliate counsel to his former partners at Michigan’s largest and most prestigious law firm, Honigman Miller Schwartz and Cohn, giving his clients access to top notch referrals in all areas of business law expertise, areas in which knowing the right person to call can make all the difference. Big Firm Experience. Small Firm Approach. Over the years, we have seen first hand how many prospective clients can be put off by the high overhead, high fee structure approach employed by the country’s biggest law firms. Over those same years, we have seen how a failure to get good (or any) legal counsel can result in significant organizational and contractual deficiencies which can cost a massive amount to correct when it comes time to operate, finance, or even sell a company. Hoeg Law was founded as a solution to that problem, offering top notch legal services at a price anyone and everyone can afford, right from the start. ​One of the hotbeds for new and growing companies in the entire United States, Southeast Michigan is home to the automotive industry, the University of Michigan, and multitudes of software, technology, and biopharmaceutical companies, as well as every other business one can imagine. 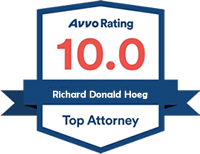 Richard Hoeg has lived or worked here for his entire adult life, and is proud to call it the home of Hoeg Law. Big City Results. Small Town Atmosphere.